My agent’s office called yesterday to let me know I’d received a piece of fan mail there. 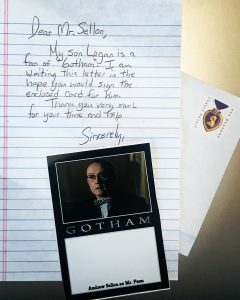 I stopped by to pick it up, and it’s my first autograph request for my work as Mr. Penn on Fox’s Gotham. I’m delighted. It’s also the most organized autograph request I’ve ever received! The note includes a nicely laminated autograph card with a picture of me as the redoubtable Mr. Penn, along with a self-addressed return envelope. Love it. I don’t know how long the Gotham experience will last, but I’m enjoying every moment with this wonderful cast and crew. Keep watching to see what happens next…! 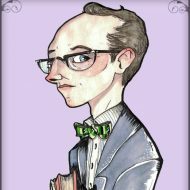 Mr. Penn is Back Again Tonight for Episode 409 of Gotham!